How does Gundry MD™ Moringa Cardio Boost help? A traditional herbal medicine that’s loaded with powerful antioxidants. This ingredient ensures you have plenty of nutrients to give you all-day energy. This natural energy booster is made from the fruit of the coffee bean. But unlike coffee, this ingredient gives you a smooth, steady supply of “clean energy.” That means you won’t crash or feel out of it at 2pm. Even better… NeuroFactor has been shown to increase BDNF levels in humans, a specific protein which has been shown to support mental energy and brain health. For over 1,200 years, ancient civilizations have benefitted from this natural “heart helper.” This potent ingredient is extracted from trees indigenous to India and has been shown to support cardiovascular health, reduce cravings, as well as increase mental and physical energy. WHAT ARE THE INGREDIENTS IN GUNDRYMD™ MORINGA CARDIO BOOST? WHO SHOULD USE GUNDRYMD™ MORINGA CARDIO BOOST? Gundry MD™ Moringa Cardio Boost contains only 100% natural and pure ingredients. The formula is tested for safety, quality, and purity at an independent, 3rd-party facility. However, as a physician I recommend consulting with your own health care provider before beginning any new program. HOW DO I TAKE GUNDRY MD™ MORINGA CARDIO BOOST? 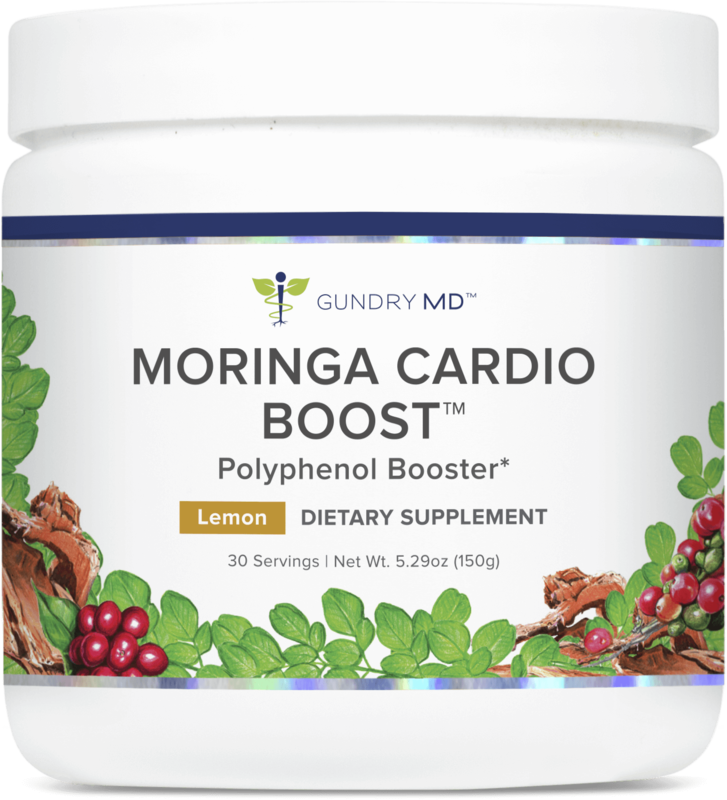 Taking Gundry MD Moringa Cardio Boost couldn’t be easier. Simply mix 1 scoop with 8 ounces of water, or your favorite beverage or healthy smoothie. We designed this drink to start going to work in your body immediately — whether you drink it all in one sitting, or throughout your day. HOW PURE IS GUNDRY MD™ MORINGA CARDIO BOOST? This formula is made in our GMP-certified facility and tested for quality and purity at an independent, 3rd-party facility. However, as a physician I recommend consulting with your own health care provider before beginning any new supplement. Many users report a distinct improvement in digestion, energy, and overall health within just a few days of first taking Gundry MD™ Moringa Cardio Boost. However, for many users, the most dramatic results were first noticed over the course of 2-3 weeks. Please use as directed. I’m confident Gundry MD™ Moringa Cardio Boost will offer you powerful support for your cardiovascular health. But I also understand no two people’s systems work the same way, so a small number of people might find Moringa Cardio Boost does not give them the benefits they need. That’s why each bottle of Moringa Cardio Boost comes with my personal 90-day guarantee. If, for any reason, this formula does not offer you comprehensive heart health support, just send back the empty jars and I’ll return your money, no questions asked… guaranteed. I run about 5 times a week and this is a huge booster for any cardio work. I highly recommend for anyone that lives an active life style.